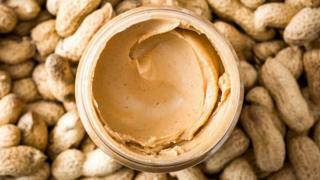 Studies have shown the risk of peanut allergy can be cut by more than 80% by early exposure. The National Institute of Allergy and Infectious Diseases said the new guidance was "an important step forward". However, young children should not eat whole peanuts, because of the risk of choking. Allergy levels are soaring in the US and have more than quadrupled since 2008. It is a pattern replicated across much of the Western world as well as parts of Asia and Africa. Parents are often wary about introducing peanut and in the past have been advised to wait until the child is three years old. Dr Anthony Fauci, the director of the National Institute of Allergy and Infectious Diseases, said: "We expect that widespread implementation of these guidelines by healthcare providers will prevent the development of peanut allergy in many susceptible children and ultimately reduce the prevalence of peanut allergy in the United States." Michael Walker, a member of the European Academy of Allergy and Clinical Immunology, said: "The guidelines are based on sound medical research carried out in the UK. "UK parents should consult their GP, bringing attention to the guidelines if necessary, before attempting peanut allergy prevention in their infant themselves." Prof Alan Boobis, from Imperial College London, said: "The previous view that delaying the introduction of allergenic foods decreases the risk of food allergy is incorrect and... if anything, the exclusion or delayed introduction of specific allergenic foods may increase the risk of allergy to the same foods, including peanut." The advice to parents in the UK is still being reviewed and Prof Boobis advised parents to follow NHS guidelines for now.